Copyright ©2012 Ruth Lor Malloy. I’m so glad someone told me about last Sunday’s Suhaag Wedding Show. It was worth the $8 entry fee. Suhaag is the biggest south Asian show I’ve seen so far. Next week’s Kismet Wedding Affair claims to be the largest in Canada. I couldn’t find its admission price on its web-site. Suhaag’s fashion show was an hour long and, unlike last week’s Dreams show, it started on time. Models from about eleven different designers, four at a time, strolled along Suhaag’s catwalk giving viewers time to glimpse the differences in style. There were see-through backs on a couple of the blouses, and fancy rosettes on some of the skirts. Several strapless gowns indicated a new-to-me trend. More glitter and sparkles appeared on the clothes than last week. There was even one western-style white wedding gown, and another gown that showed the knees. I wondered what’s happening to traditional Indian morals? And fashions? Are they deteriorating? Going too far? New backless blouses. Copyright ©2012 Ruth Lor Malloy. Were those seed pearls I saw on the men’s tunics? With so many different colours, does a wedding planner attempt to colour-co-ordinate the clothes of the bride with the groom? Some of the dresses were so heavily laden with gems, stones and metal, that I wondered if the average bride could carry the weight. Do brides actually wear these dresses? Yes, said the lady next to me. She did when she was married. The Suhaag was more crowded than the Dreams Show and it had more wedding cakes and fancy baked goods on display. One huge cake had a sign with a $600 price tag. Beautiful thrones stood ready for the bride and groom could sit during ceremonies. I learned what a “doli” is. It’s a sedan chair carried by four men, in which sits the bride. There was also a Hummer limo. One of the vendors indicated white horses for hire. Indian bride grooms traditionally show up riding a white horse. Some obviously do that in Toronto too. Pakistani-Canadian designers displayed wedding clothes that was more modest. While it seems Indian women generally think nothing of showing bare arms and midriffs, the clothes for Pakistanis brides cover almost all the body, though not the face. Their dresses were conservative and less glitzy. I liked some of the colour combinations. No burkas were on display though. I didn’t see any burkas at the event – not even among the spectators. 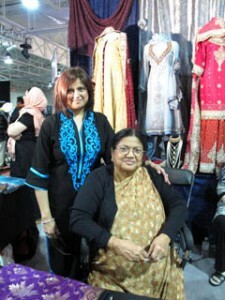 Pakistani designer Rehana Quadri and daughter Maliha Basith. Copyright ©2012 Ruth Lor Malloy. The daughters of Pakistani designer, Rehana Quadri said she had started her wedding clothes business in Pakistan. Today, she and her daughters, Canadian citizens all, sell by appointment only from Mississauga. All their clothes are made in Pakistan. When I got there a half hour before the fashion show, I spent at least 15 minutes trying to find a parking spot. There must have been at least a thousand people attending. It was an amazing show. Not everybody was interested in weddings. The woman sitting beside me was there because she liked fashion shows. I left with the impression that Toronto’s south Asian community was far from poor, and that basic traditions from the home country are still thriving. Can anyone tell me if Hummer limos are used now for weddings in India? Let me know what you think about these three shows. Details for the February 12 Kismet show are on: www.TorontoMulticulturalCalendar.com.